R18: allows you to view all content. Press Menu and select Parental Control. Enter the default PIN 1234. Insert the default (1234) or your old PIN. Insert your new PIN and repeat. *The cellphone number you use when dialling *120*68584# must be the number you registered when activating your DStv account. What is my Smart Card? The Smart Card looks similar to a credit card and is inserted into the device. A valid Smart Card entitles the customer to listen and view all the services they have subscribed to. The customer's Personal Identification Number (PIN) and subscription details are stored in the Smart Card. The latest Smart Cards now come with the fraud eliminating Secure Silicone. These would be the 1110/1131/3U, HD PVR devices. Secure silicon chip set is embedded in the device. The initial activation marries the smart card to the device. This however does not include the Standard PVR device, as it was produced before silicone security was introduced. The Smart Card has a number on the reverse side of it, under the barcode. This number is stored onto the MultiChoice system along with the customer's details. This is the same number that is paired to the device serial number after production. Once found press the power button to store. From normal viewing environment Press MENU on the DStv remote control. The decoder MENU should display on the TV screen. Press 1 on the DStv remote to select Information Central. Press 4 on the DStv remote control. UHF test patterns will display on the TV screen. The front panel on the decoder should display Channel 63. If not, please press the right arrow key on the decoder remote until UHF channel 63 displays on the front panel of the decoder. During this process Audio and Video will be lost. DO NOT press OK on the decoder remote yet. Tune the TV till UHF test patterns display on the TV screen. Store the settings on the TV. Now press OK on the decoder remote to store the new output frequency 63 on the decoder. From normal viewing environment on TV 1 Press MENU on the DStv remote control. The decoder MENU screen should display on the TV screen. Press 4 on the DStv remote control for TV Installations. Press 2 for TV installation for TV 2. UHF test patterns will display on the TV screen. The front panel on the decoder should display Channel 63. If not, please press the right arrow key on the decoder remote until UHF channel 63 displays on the front panel of the decoder. During this process Audio and Video will be lost on TV 2. DO NOT press OK on the decoder remote yet. Tune TV 2 till UHF test patterns display on the TV screen. Store the settings on the TV. To tune TV1 to the UHF channel for the second TV environment follow the same procedure above, except in step five press 3 for TV 1 installation. For TV 1 UHF test patterns (Black screen with two white bars) will display instead of the rainbow colours that display for TV 2. Possible fault: Possible faulty decoder or faulty installation. 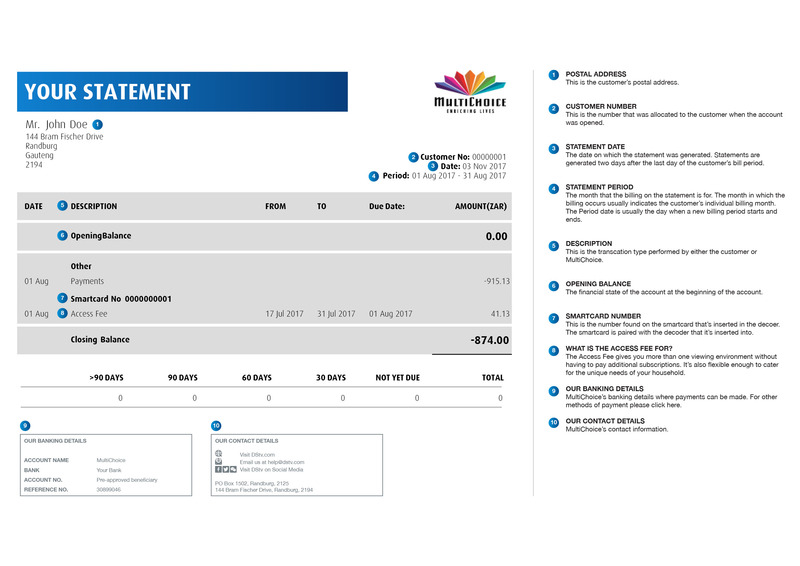 Recommendation: Decoder and smartcard should be taken to MultiChoice for testing, before the DStv Accredited Installer is called. Please check the cable connections and ensure that they are in firmly. Check and ensure that the TV is on the PAL I system. Try fine tune the TV if on a 'normal' TV channel, eg channel with a number, not AV. Try retune to a different UHF channel. First adjust the decoder to a new Ultra high frequency (UHF) and retune the TV. Check that the time isn't showing on the decoder panel, if it is then Press the Power button on the DStv RCU. Check that the TV is on the correct channel or on the correct AV mode. Either Press the TV/AV or TV/VIDEO or FUNCTION or SOURCE button on the TV RCU. 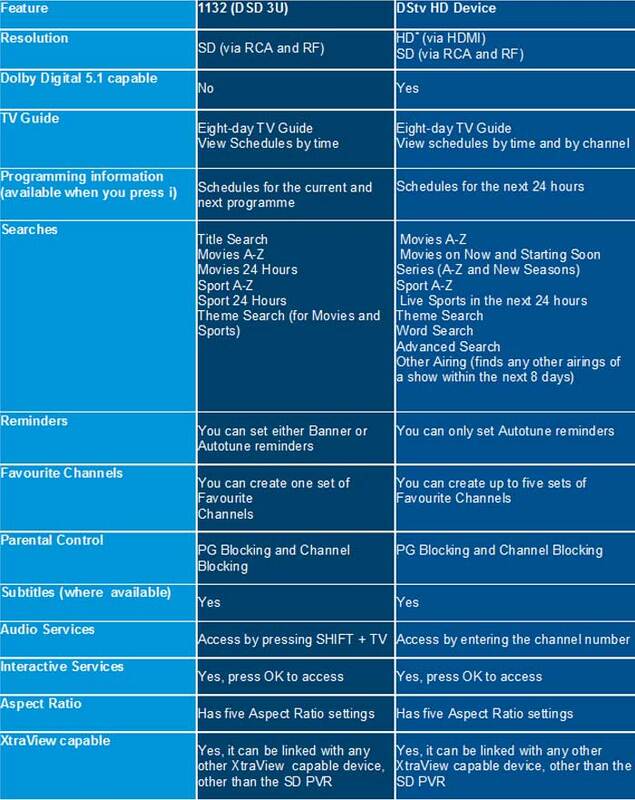 If there is any other device besides a TV and Decoder e.g. VCR or DVD, please ensure that it is ON and on the correct channel or Mode.